The last few days I have been flooded with emotions — fear, sadness, grief— but gratitude wins out. When I stop to think about how this week has been, I don’t quite know where to begin. I awoke Thursday morning to several text messages asking if I had been at Borderline, our local country bar, the night before. Confused, I sent quick responses assuring that I was home and safe. I typed “Borderline” into Google and the news of the shooting quickly flooded my screen. It was so strange to see the parking lot, entrance, and neon sign that I knew so well illuminated by police lights. This could have easily happened on one of the many nights I spent at this local haunt. We awoke around 1:45 a.m. to a cell phone buzzing. When we saw a friend’s name on the screen, we ignored it, saying we’d catch him tomorrow. Within a minute, the phone buzzed again showing the same name. My boyfriend answered his phone only to hear “Hey…umm…. Where are you?” Those words, in light of the shooting the night before, immediately put me on edge. Our friend quickly explained that most of Thousand Oaks was evacuating, and that my area in particular had flames threatening nearby. I walked downstairs to look outside and when I opened my front door, I saw my mom approaching the porch. When I didn’t answer my phone, she knew she needed to come and wake us herself. I then noted several missed calls from my parents, landlord, and friends, and quickly discovered that this evacuation had been going on for over an hour. I jumped into gear, waking my two roommates and shoving what I deemed to be my more important belongings into a duffel bag. I loaded my sleeping bags, duffel, a box of documents, and my laptop into the car and didn’t look back. I had tunnel vision as I followed our caravan of four cars through several pockets of flames in my neighborhood. 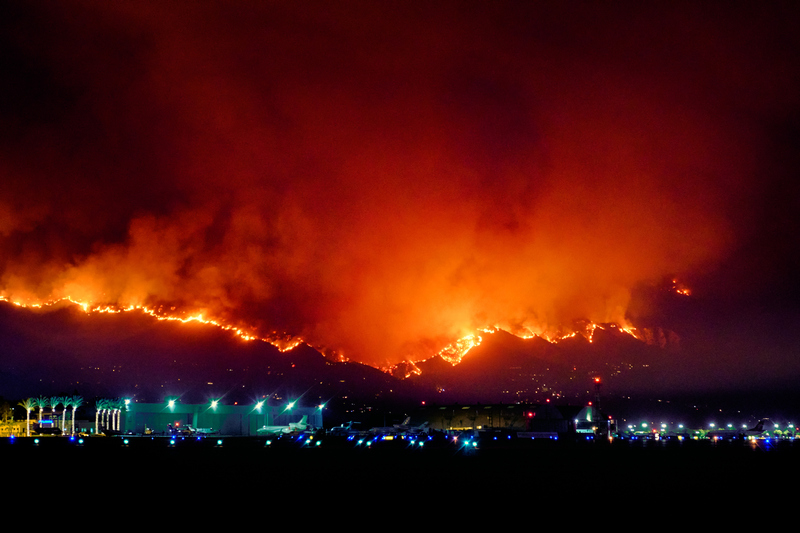 On two occasions we passed large hills of flames that came right down to the street. I was so focused on not losing the cars in front of and behind me that I didn’t really notice the state of everything around me until I was at a stoplight. I looked around and saw fire trucks down the street, cop cars heading in my direction, and directly to my right, a firefighter in full gear driving a civilian car. Suddenly I realized how real this was, and I couldn’t believe that it was happening in my town. A sleepless night followed as the fire continued to grow and we moved through two locations further south. I remained surprisingly calm throughout this evacuation, and did not begin to register my fear and relief until later that weekend. In moments of restful silence, I would find myself recalling that experience and breaking into tears. I felt fear, relief, and sadness as I digested all that my community had been through in a mere 48 hours. Although I feel beyond grateful that none of my friends were hurt in the Borderline shooting, the understanding that this can truly happen anywhere shakes me to my core. And while I feel blessed that my family, friends and home are safe after the fire, that doesn’t mean I feel comfortable or satisfied. Our town is operating in a state of limbo, and most of us are deeply uncertain of how comfortable to get in our homes for fear of re-evacuation. I am still stunned that this town and its neighboring communities were faced with so much in so little time, but I am comforted by the outpouring of support that has already spread throughout our community. Rebecca Winter is a 5th grade teacher in Thousand Oaks, California. She has been working at MATES Charter school for the last five years, and is currently pursuing a masters degree in Educational Leadership. She grew up in Thousand Oaks, moved to Orange County to earn a bachelor's degree in English Literature, and returned to her hometown to pursue her teaching career. Rebecca has always enjoyed writing and is honored to share her experience with Thrive Global. While it was an emotional week in her town, Rebecca remains in awe of the love and support that the town has given and received during this time.